This piece of artwork can be seen in on a wall, in 2 rue Emilie Deslandres. 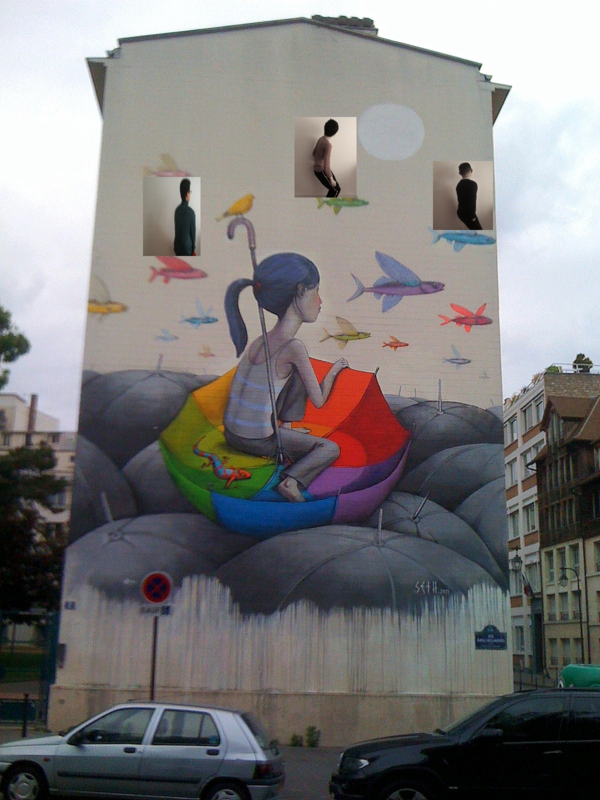 It was painted by Julien Malland in 2013. We chose this arwork because it’s beautiful and when we saw that, we were really impressed. We love this artist and we respect him because he is the best artist we’ve seen since we discovered his first artwork. The first artwork shocked us and helped us in the future. We sat on the fish: we wanted to give the impression that we were looking on the horizon to find land where people lived. This graffiti whose name is ballon girl , is a 2002 mural by artist Banksy ,the most famous of these is the one discovered in the south bank of London in 2002 on the wall of a stairway, this graffiti depicts a young girl letting go of a heart-shaped balloon but she was a little reluctant. 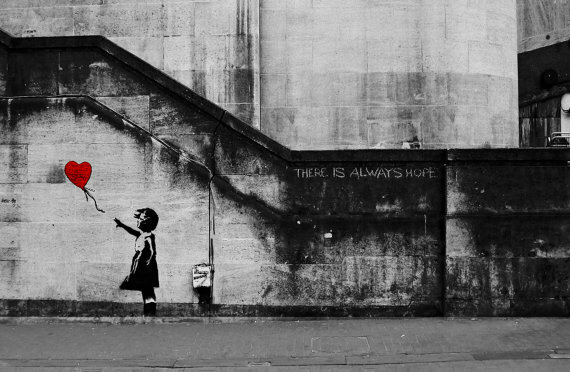 She wants to spread the love to the world ,and there’s a sentence on the wall “there is always hope”. In march 2014 the third anniversary of the Syrian conflict, Banksy reworked the painting to depict a Syrian refugee and added the hashtag #with Syria . I think this painting brings people more warmth and love, all the love passed to the world. Le lundi 20 mars, un membre de la galerie itinérance nous a présenté des œuvres de S.A., des Street Artists célèbres comme Banksy ou Kobra et leur maniére de graffer leurs œuvres sur des murs. Il nous a expliqué que cela arrivait que des propriétaires de maisons, d’appartements ou autres batiments permettent aux Street Artists de peindre dessus mais quelques semaines après, juste avant que leur travail commence, les propriétaires disaient qu’ils n’en voulaient plus et cela causait des malentendus entre l’équipe et le propriétaire. This piece is an artwork of Banksy who shows two mens in banana suits. Maybe the Street Artist banksy would like to show the war inthe world and the banana suits would make this work more joyful. Originally consisted of the two men pointing bananas, rather than the firearms used in the film. At the bottom, I can see a black color and maybe a fire extinguisher at the left of the piece, I don’t know if the fire extinguisher is painted or if it is a real object. I can see also the number 7 on the fire extinguisher.